Find 15 European animals in the fun online geography learning game. 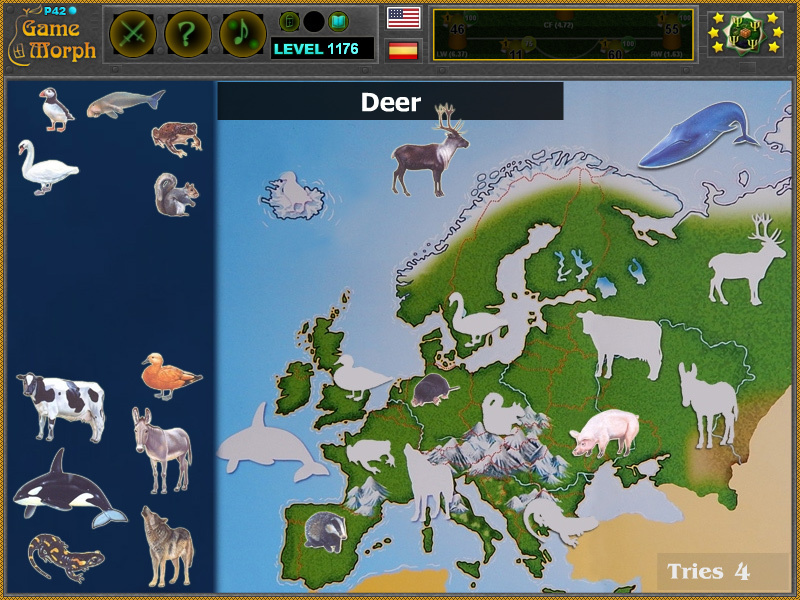 "Animals of Europe Puzzle" is a free online knowledge level game to place the animals where they fit in the map of Europe. Free online game to explore European animals, suitable for online lessons and interactive classes. Minute to win it game. Fauna game. All game pictures belong to Hermes Publishing. Game code by Ogo Bob. How to play Animals of Europe Puzzle. There are 16 movable pieces of animals, which inhabits Europe, situated on the left side on the screen. Drag and drop them in the correct place on the map of Europe. One of them do not belong to Europe. Know 12 European animals and get +1 Knowledge Level. The formation of the European fauna began in the Mesozoic with the splitting of the Laurasian supercontinent and was eventually separated from both North America and Asia in the Eocene. During the early Cenozoic, the continents approached their present configuration, Europe experienced periods of land connection to North America via Greenland, resulting in colonization by North American animals. In these times, higher sea levels sometimes fragmented Europe into island subcontinents. Which are the animals of Europe?